SSDO - Improvement of SSAO such that approximates the global illumination, i.e. light bouncing off of objects onto other objects, kind of a holy grail of CG. That would be getting us closer to that PBR look. 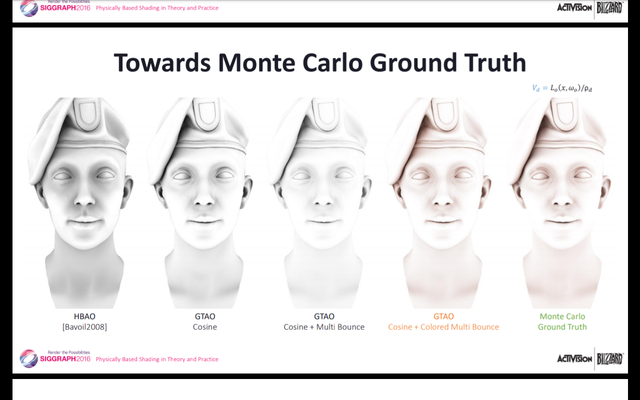 GTAO - Looks like the most accurate SSAO method that is almost indistinguishable from the ground truth AO (but still only on the scene modeled with depth buffer, so the problem I was talking about above still stands). From the reading I've been doing, GTAO seems to be top-tier as far as screen-space techniques go, and anything that isn't screen space is necessarily very expensive. It shouldn't be that hard to implement regular SSAO, then incrementally change it to HBAO+ and then GTAO. Alternatively, if anyone knows someone working at AMD, we could nag them until they make a nice, flexible implementation of all the effects we need and release them as part of GPUOpen. Loads of the future nice things I want this engine to have would be sensible things to have as part of GPUOpen. GameWorks has a good shadow library that can be plugged into new engines, for example, so if AMD had made something that could compete and given it a permissive licence, I'd have been saved a bunch of work.